With the third anniversary of the start of the Fukushima Daiichi nuclear catastrophe coming next week, the attempted Giant Lie about the disaster continues—a suppression of information, an effort at dishonesty of historical dimensions. It involves international entities, especially the International Atomic Energy Agency, national governmental bodies—led in Japan by its current prime minister, the powerful nuclear industry and a “nuclear establishment” of scientists and others with a vested interest in atomic energy. Published in 1980, the book led to my giving many presentations on nuclear power at which I’ve often heard the comment that only when catastrophic nuclear accidents happened would people fully realize the deadliness of atomic energy. Well, massive nuclear accidents have occurred—the 1986 Chernobyl disaster and the Fukushima catastrophe that began on March 11, 2011 and is ongoing with large discharges of radioactive poisons continuing to be discharged into the environment. Meanwhile, the posture of the nuclear promoters is denial—insisting the impacts of the Fukushima catastrophe are essentially non-existent. A massive nuclear accident has occurred and they would make believe it hasn’t. The difference with Fukushima is the scale of disaster. With Fukushima were multiple meltdowns at the six-nuclear plant site. There’s been continuing pollution of a major part of Japan, with radioactivity going into the air, carried by the winds to fall out around the world, and gigantic amounts of radioactivity going into the Pacific Ocean moving with the currents and carried by marine life that ingests the nuclear toxins. Of the consequences of the Fukushima disaster, “To date no health effects have been reported in any person as a result of radiation exposure from the accident,” declared the IAEA in 2011, a claim it holds to today. The IAEA-WHO deal has meant that “WHO cannot undertake any research, cannot disseminate any information, cannot come to the assistance of any population without the prior approval of the IAEA…WHO, in practice, in reality, is subservient to the IAEA within the United Nations family,” explained Alison Katz who for 18 years worked for WHO, on Libbe HaLevy’s “Nuclear Hotseat” podcast last year. Then there is the new prime minister of Japan, Shinzo Abe, who last year insisted before the International Olympic Committee as he successfully pushed to have the 2020 Summer Olympics in Tokyo (180 miles from Fukushima): “There are no health-related problems until now, nor will there be in the future, I make the statement to you in the most emphatic and unequivocal way.” Abe has been driving hard for a restart of Japan’s 54 nuclear power plants, all shut down in the wake of the Fukushima catastrophe. A major factor in Abe’s stance is Japan having become a global player in the nuclear industry. General Electric (the manufacturer of the Fukushima plants) and Westinghouse have been the Coke and Pepsi of nuclear power plants worldwide, historically building or designing 80 percent of them. In 2006, Toshiba bought Westinghouse’s nuclear division and Hitachi entered into a partnership with GE in its nuclear division. Thus the two major nuclear power plant manufacturers worldwide are now Japanese brands. Abe has been busy traveling the world seeking to peddle Toshiba-Westinghouse and Hitachi-GE nuclear plants to try to lift Japan’s depressed economy. What will the consequences of the Fukushima Daiichi nuclear disaster be? It is impossible to know exactly now. But considering the gargantuan amount of radioactive poisons that have been discharged and what will continue to be released, the impacts will inevitably be great. The claim of there being no consequences to life and the prediction that there won’t be in the future from the Fukushima catastrophe is an outrageous falsehood. A death toll of up to 600,000 is estimated in a study conducted for the Nordic Probabilistic Safety Assessment Group which is run by the nuclear utilities of Finland and Sweden. At Fukushima, “We have opened a door to hell that cannot be easily closed—if ever,” said Paul Gunter, director of the Reactor Oversight Project at the U.S.-based group Beyond Nuclear last year. Already an excessive number of cases of thyroid cancers have appeared in Japan, an early sign of the impacts of radioactivity. A study last year by Joseph Mangano and Dr. Janette Sherman of the Radiation and Public Health Project, and Dr. Chris Busby, determined that radioactive iodine fall-out from Fukushima damaged the thyroid glands of children in California. 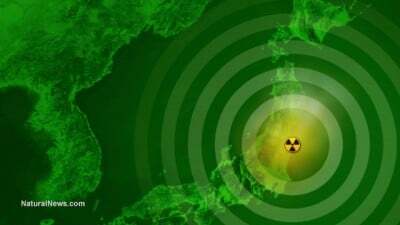 And the biggest wave of radioactivity in the Pacific Ocean from Fukushima is slated to hit the west coast of North America in the next several months. Thus the desperate drive—in which a largely compliant mainstream media have been complicit—to deny the Fukushima catastrophe, a disaster deeply affecting life on Earth.